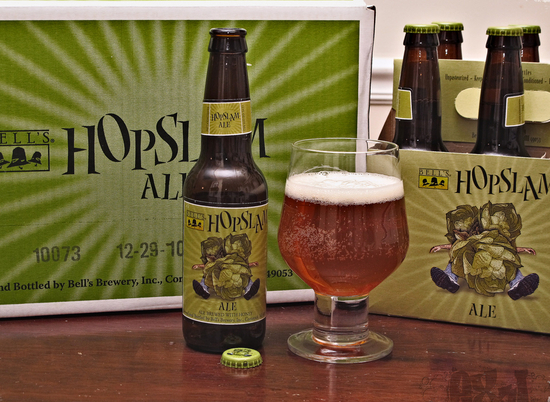 Posted on Thu, Jan 5, 2012 : 4:30 p.m.
Are you ready for some Hopslam? Ashley's taps the first keg of 2012 on January 9. Meet the new year, same as the old year. Or is it? This week there are a couple of tried-and-true regular local events, but coming up are several groovy happenings you'll want to be a part of. Hold on to your resolutions and take a trip through your first full 2012 Week in Beer, straight ahead. >> The bi-weekly Michigan beer tastings resume at Whole Foods Cranbrook, 990 W. Eisenhower, with Ann Arbor’s own Wolverine State Brewing — leaders of the Lager Revolution, comrades! — in the spotlight. From 5-7 p.m., enjoy $3 glasses or $1 sample pours of selected Wolverine draft lagers and various prices on bottled Michigan beers, of which Whole Foods has a good selection. >> The first monthly beer tasting of 2012 takes place at Arbor Brewing, 114 E. Washington, from 7-9 p.m. Get your malty on as more than two dozen porters and brown ales from around the state, country and even world will be at your drinking disposal, along with a snack buffet and a raffle of cool beer swag. Tickets are $25 in advance and $30 the day of. Stop by the brewpub or call 734-213-1393 to get yours. The Lake Street Tavern, 127 E. Lake St., South Lyon, is hosting a five-course dinner on Jan. 18 at 7 p.m. featuring the beers of Short's Brewing. The cost is $40 per person; call 248-446-8898 for more information and to reserve. Tickets are on sale now for the 2012 Rat Fest homebrew tasting at the Corner Brewery on January 28. For a mere $25 you can sample from 32 small-batch brews created by local homebrew clubs on the Corner’s 10-gallon "Rat Pad" system, including the wacked-out likes of Orange Creamsicle Ale, Honey Badger American Pale Ale, Pig Roast Porter and Loaded Baked Potato Stout. Tickets also include an appetizer spread and a commemorative tasting glass to take home. Advance purchase is recommended as this event is likely to sell out; call the brewery at 734-480-2739. Tickets are also on sale for the Jan. 29 beer tasting at Eve Aronoff’s Frita Batidos restaurant, 117 W. Washington, with plenty of good Michigan microbrews and delicious Frita food, which, if you haven't tried, you really should. And what better time than now? Tickets are only $20; RSVP at frita@fritabatidos.com or call 734-761-2882. Sat, Jan 7, 2012 : 4:19 p.m.
Fri, Jan 6, 2012 : 4:32 p.m. The 'Loaded Baked Potato Stout' sounds terrible. Fri, Jan 6, 2012 : 2:14 p.m.
Fri, Jan 6, 2012 : 7:34 p.m.